This summer, Hotel Arts Barcelona is excited to announce their 2018 nighttime event series with an exciting twist and new venues. The luxury hotel is kicking off the hottest season with “90 Lunas”. Noventa Lunas (or Ninety Moons) represents the 90 nights of summer celebrations at the hotel, where nearly every evening is filled with entertainment, including weekly local DJs, live music and sponsoring local and international liquor brands at reinvented hotel venues. It will be the first time that 90 Lunas will celebrate summer at the new infinity pool and lounge, redesigned cocktail bar P41, and newly transformed causal restaurant Bites. The new infinity pool was built to complement the existing pool in a new, distinctive space of the property. The new area around the pool is a versatile space that acts as a relaxing, urban oasis during the day and transforms into a vibrant hot spot lounge at night for guests and locals alike to mingle while enjoying cocktails and tasting small bites. The pool and lounge area will celebrate 90 Lunas with an array of food and drink menus nearly every night. Festivities include Infinity Moon – every Monday, Wednesday, Friday and Saturday – offering cocktails and bites that go along with live music and DJ’s. Gin O’Clock – every Sunday – for guests wishing to taste a variety of gin and tonics while poolside from the hotel’s Gin Trolley. Other events as L’Atelier Grey Goose – happening every Thursday – an evening affair that will transport guests to different locations across France with four different cocktails. In addition to the new infinity pool and lounge, Hotel Arts Barcelona has refurbished other spaces that will also be available for guests enjoyment. P41 is a newly opened bar featuring cocktails inspired by destinations that run along the 41st parallel (anywhere from Barcelona to Rome to New York). A place where guests can gather to enjoy an speakeasy atmosphere. Also renovated was Bites, a casual restaurant offering a variety of light, simple dishes from early morning until midnight. Bites will offer an assortment of specialty coffee and teas throughout the season and host wellness-related activities such as yoga to start the morning off on a positive note. Lastly, the hotel has also recently opened Lokal, a breakfast restaurant consisting of a buffet with locally sourced produce and an on-site kitchen to prepare hot foods upon request. 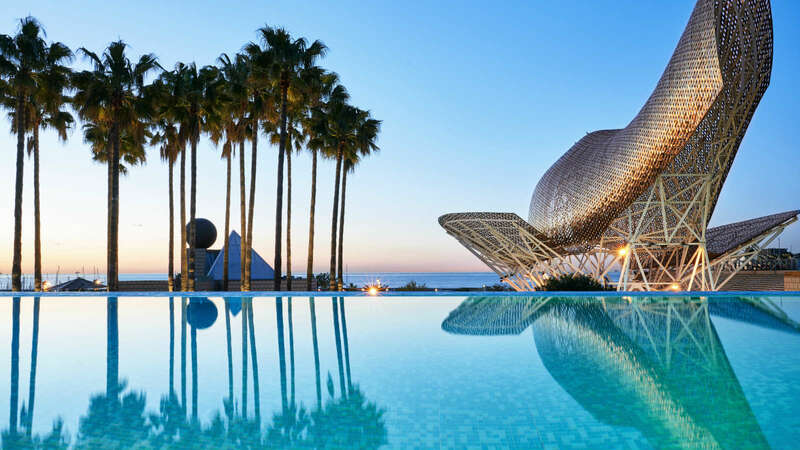 Located very close in proximity – less than a 5-minute walk – to the beachside and pulsing nightclubs of the city, Hotel Arts Barcelona truly maximizes the laid-back, fun attitude that comes along with summer. Additionally, the waterfront hotel features 455 rooms and 28 exclusive penthouses as well as the luxurious 43 the Spa and Michelin-starred restaurant, Enoteca.